Are you an entreprenuer devoting an ungodly amount of hours to your small business? Or an employer whose workers are racking up crazy overtime hours? Putting in excessive hours may create the perception that you are an overachieving team player, but at what cost? The overtime epidemic exists in all sectors – white and blue collar alike. Corporate Executives and Attorneys are feeling the drain. But General Practioners are perhaps the most sapped, accomodating thousands of patients in their care. One UK study found that 27 percent of GPs are working over 50 hours per week, which is generally considered unsafe. These GPs are seeing upwards of 50 patients per day at their UK clinics, double the average of their counterparts in other parts of the country. Breaks are nonexistent and taking time for lunch is a rarity. While mental stress is wide-spread across countless industries, blue-collar jobs, like that of a construction foreman, are characterized by physical exhaustion. Pressure-packed situations and intense manual labor can create dangerous levels of burnout amongst workers. Many in this sector – police officers, for example, are subject to long, anxiety-filled hours. And if they're on call, they are unlikely to experience much downtime, so they never truly decompress. 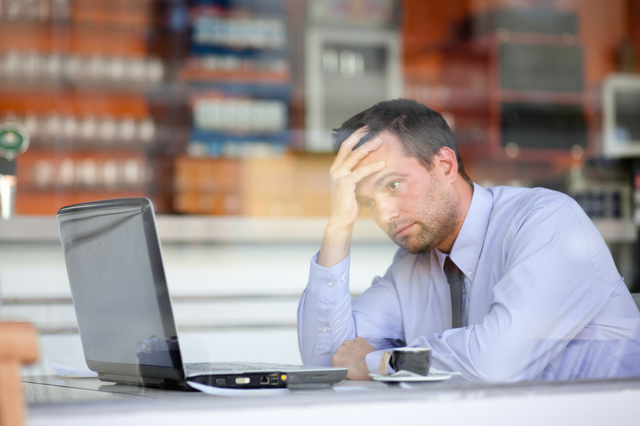 The constant strain of these excessive hours can do some serious damage – in all areas of work and life. Research indicates that working over 10 hours per day is associated with a 60 percent increase in heart conditions. A myriad of adverse health issues including weight gain, high blood pressure, bodily injury and suicidial tendencies were also tied to too much overtime. Alongside high stress levels, alcohol and tobacco consumption also increased. Being overworked not only harms your physical body, but also takes a dangerous toll on your mental health as well. If you're at the office first thing in the morning and the last to leave at night, chances are self care is obsolete. Not finding the time to eat well and exercise can quickly pave the path to depression. Negative attitudes and self-pity are unpleasant, and people generally dislike being around others whose moods can be nasty and unpredictable. It's no wonder divorce rates are higher when one spouse is working unusually long hours. Add a long commute into the mix and you're 40 percent more likely to end up single again. You'd be hard-pressed to find a business where productivity soars when employees are logging over 50 hours a week. In fact, the research points to an opposite effect. Trade industries report that a 10 percent increase in overtime results in a 2.4 percent decrease in productivity. White collar jobs get hit twice as hard, noting a 25 percent percent decline in productivity when workers are putting in 60+ hours. When fatigue sets in, you naturally work slower and become less focused. You may be putting in hours, but the quality of the work suffers. The domino effect of depression and sickness typically culminates in needing to take time off from work. In over half of companies where high overtime is commonplace, absenteeism levels were above 9 percent. Sleep is what you need most to combat exhaustion. Yet, stressed, overworked employees may find it especially difficult to fall asleep – and stay asleep. They can't "shut off" their brain and they rarely live in the moment. This lack of quality rest and mental downtime takes a dangerous toll on the human body. Pilots, construction workers, truck drivers, and the like, must be sharp in order to stay safe. But when logging long days – in excess of 16 hours – accident rates have shown to triple. Overtimers work long days that lead to late nights, and that doesn't leave room for much else. Along with family activities and relaxation, time management goes out the window. Feeling like a hamster on a wheel? Chances are you easily lose track of time. No surprise then that frazzled employees find themselves perpetually late. According to a poll done by The National Sleep Foundation, 12 percent of employees were late to work over the course of a month due to sleep-related reasons. Nearly 30 percent of respondents fell asleep (or came very close) while at work. Though it may not be possible to cut out overtime altogether, reducing employee hours and taking steps to reclaim the 40 hour work week might be a good approach for your company. With a reliable employee time tracking system, you can easily monitor your on-the-clock mobile employees, keeping regular and overtime hours in check. 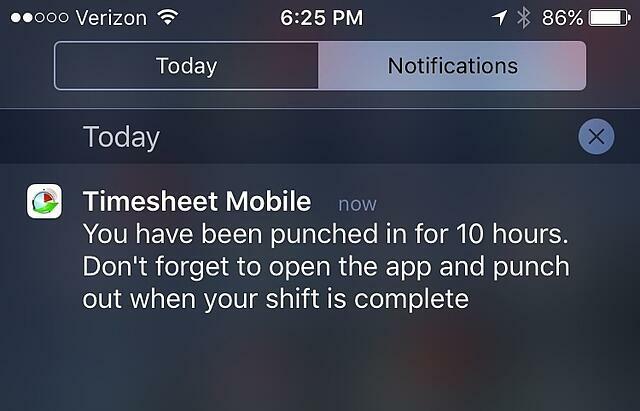 The Timesheet Mobile app features an Over 10 Hour Alert that automatically notifies smartphone users when they have been punched in for over 10 hours. This alert is generated in addition to exclusive Punch Prompt® reminders that users receive upon entering and leaving a geofenced job location. Managers can also enable the system to have overtime alerts emailed to them. With a better grasp of how employees are spending their time, you can create a more efficient and productive environment for working smarter, not longer.